Scads of warmwater patterns suitable for farm pond fishing are available from a variety of companies. The flies listed in this article include Hickey’s Condor, Hansen’s Electric Frog, Cicada Orange Legger and the San Antonio Worm. Umpqua Feather Merchants (800-322-3218) manufactures the Gummy Minnow and many other great patterns. Walt’s Poppers and B.H. Goldilox woolly buggers are available at fine fly shops across the country but particularly in Virginia and the Carolina’s. Farm ponds and small aquatic impoundments crisscross the country and are found in nearly every state. Gaining access to these ponds is your first step to success. Though most fly shops have the skinny on public water, many farm ponds are privately owned. Ask someone in your local fishing club or a friend at work where he or she spends a lazy afternoon pursuing panfish. More often than not, you’ve spotted an idyllic, sun-dappled pond from the road and longed to wet your line in it. If you find a likely-looking spot, just do the obvious. Pull up in the driveway and introduce yourself to the owner. Tell him that you’re a fly fisherman and that you’d like permission to fish in his pond. Let him know that you don’t intend to keep any fish—unless that is acceptable to him, in which case you’d be willing to catch and clean a few for the owner as well. Specify when you would like to fish, where you would like to park, and when you intend to leave. Assure the owner that you won’t leave any trash behind and that you would be willing to pick up any trash that you do see. Finally, keep any gates closed that are opened to access the ponds. One sure way to get yourself kicked off the property is to let the livestock out by inadvertently leaving open the gate. Fish the water that is closest to you first. The first six inches away from the bank are often the most productive. 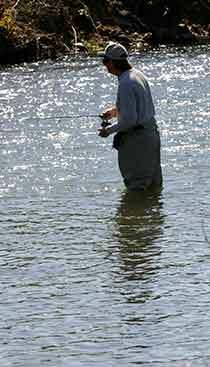 Rookie anglers often make their first cast of the day several feet out towards deep water. They believe the myth that big water means big fish; in fact, this is only half true. Though big fish do like the safety of deep water, they also like finning in very shallow water. I have seen farm pond bass in water so shallow I could see their dorsal fins sticking out, making them look like freshwater sharks. Don’t scare the biggest fish of the day away by being too eager. If you are a decent caster, and the brush or grass growing along the edge of the water will allow you, stand a few feet back from the edge of the pond. Present your fly a foot or less away from the bank. A word of warning, though—hold on to your line. You may have seen nothing but bluegills and small fry along the shore, but I assure you that large fish feed regularly along the banks of most ponds. The reason that we don’t see them as often as we might is probably because of our ponderous approach to the water’s edge. To be a successful small water angler, sometimes you need to shift your thinking. You’ve heard it a thousand times: fish the structure. What you may not have realized is that sometimes structure moves. Moving structure? A contradiction in terms, you say. But that’s because you don’t think like a fish. Lily pads and other aquatic plant life are excellent examples of moving structure that provide great hangouts for bass and other fish. This freshwater vegetation grows—and therefore moves into new areas of the pond—as the longer days of summer provide more sunlight. A small pond near my home is almost completely grown over with lily pads by the end of summer. Never miss a chance to fish this prime area. Vegetation in one part of a lake or pond may have moved several feet or more within a single month. And if you see an open spot amid a crowd of lily pads, try casting into that opening—and then wait. A fish should notice your fly before too long. In a sense, shade falls into the category of moving structure as well. Shade is important because it changes the water temperature as the day progresses. It also moves by virtue of the fact that the sun’s rays are obstructed by different objects at different angles—and therefore hit or miss different sections of the pond—throughout the day. Bass and many of their pond-dwelling compatriots cannot shut their eyes. As the dog days of summer lengthen and heat up, such fish naturally follow the shade in the pond they inhabit. Don’t overlook the hidden gems in the water in your eagerness to fish the obvious structure. That old stump protruding coyly just above the surface of the water is indeed inviting; if you do, however, catch Bubba, king of the pond, lurking beside that stump, the resulting action could ruin the rest of the water. That one lunker fish may scare away everything else for yards in every direction. Instead, begin casting to the less obvious spots. This allows you to get the feel of casting in the pond as well as to experiment with various flies to determine what is most effective. In a farm pond or anywhere else, catching the big fish is most rewarding as dessert rather than as appetizer. Don’t wait to get off the dock before casting. Many anglers overlook docks, retaining walls, and pilings—all common in and around freshwater impoundments—in their eagerness to hit the boat or the obvious waterbound structure. So before you walk off the dock, cast under it. You might be surprised by what’s hiding underneath it. In many cases, only a fraction of the pond may be fishable from the bank because limited space exists for back cast. Faced with such a dilemma, consider a float tube or canoe. Both are excellent for fishing in still water. An alternative is a kayak. Most fly anglers think of kayaks as strictly rapid water vehicles, but in fact some kayak companies have developed products designed specifically for the angler. Heritage Kayaks, www.heritagekayaks.com, for example, markets a Featherlite Angler model that weighs only 39 pounds and is perfect for stealthy approaches in ponds and tight areas. Kayaks and float tubes allow you to maneuver around trees or parts of the pond that are inaccessible to the wading angler because of water depth. Trout are not the only freshwater fish that have much to fear from overhead predators. Herons, egrets, and even kingfishers, eat fish. Overhanging branches and undercut banks are prime locations for bass and other fish to seek safety from these winged predators. The branches of some of these trees often grow out just above the water’s edge. Caterpillars and ants sometime become the soup du jour when they slip off the branches and fall into the water below. As a result, casting under such branches and banks often yields success—if you can manage it. Have a strong tippet if you try this maneuver; many a hungry tree branch has reached out and caught the fly I had intended for the water below. Strong tippets will allow you to maneuver your fish out from the banks quickly or retrieve your fly from greedy tree limbs. Effective fly patterns are often the key to success on your local pond. I love to see a surface strike, and therefore I enjoy fishing topwater patterns. One of the most effective flies I have ever used is Hickey’s Condor, which is tied to imitate a dragonfly, an insect ubiquitous at the average farm pond. Another favorite surface pattern is Hansen’s Electric Frog, which is brighter than most Christmas tree lights and elicits the same response from fish that presents evoke in kids on Christmas Day. Since this is a big year for Cicadas you may want to try tossing a couple of patterns like the Cicada Orange Legger. Poppers of all varieties can also be a thrill a minute. A friend of mine named Walt Carey makes poppers that look like everything from bees to baby bluegills; many fly shops across the country carry such patterns. All of these flies have rubber legs and can be fished quite effectively by casting them in a likely area and not moving them for moments at a time. This can be nerve racking, but it’s quite thrilling as well. Cast your fly in a likely spot—and then just wait. After a few moments, give the fly a gentle tug across the water—perhaps just enough to move its legs. Then wait again. Don’t worry: When you’re fishing with an effective topwater pattern, you won’t have to wait long. If the fish you’re after won’t come to you, then you may have to go to him. Time for the subsurface patterns. Weighted flies like the San Antonio Worm are great for searching out deeper water. A relatively new pattern on the market is the Gummy Minnow. This fly not only looks like the real thing; its soft rubbery body feels like flesh. As a result, if your fish does strike the Gummy Minnow but misses the hook, he’s more likely to give it another go because, unlike biting into a hard cork popper (which, let’s face it, must be as unpleasant experience for a fish as it would be for a fisherman), the fly feels soft and real. Another constant in my fly box is the BH Goldilox, a woolly-bugger type fly carried by most fly shops. When it comes to farm pond gear, less is definitely more. A handful of good flies, 3X and 4X leaders with short tippets at the end of a weight forward floating line, and a small vest are all you need to fish. As a paramedic, I strongly advise that you include a hat, sunglasses, bottled water, and copious amounts of sunscreen. And if you prefer to be prepared for everything, have a rain jacket on hand. Effective rods range from the 7-foot 3-weight for bluegills to the 9-foot 8-weight for bass. The species you decide to pursue will determine which rod is most appropriate. A bluegill on a 3-weight can put a smile on your face that it might take a week to wipe off. If you’ve caught plenty of fish and want to go trophy hunting, you may opt for the heftier rod, which allows you to throw much larger flies and thereby discourage smaller fish from striking. Farm ponds and other fresh water impoundments hold one more attraction: They are the perfect places to introduce your kids to the joys of fly angling. If you consider yourself an intermediate or better caster, it might be time to share the sport with someone else. My father used local farm ponds to introduce me and my brother to the joys of fishing. Those childhood memories are among my most cherished, and my brother and I speak of those days often. Now that I’m a father myself, I look forward to the day that I can outfit my own little one and pass on the finer points of fishing farm ponds. Virginia. He can be reached through his website, www.beaubeasley.com.